How you should use Facebook audience insights for better targeting? If we have an opportunity to work with the social media, we must use it. Why? Because social media gives us an ability to connect brands and companies directly without any problems. It could be a feedback on posts (likes or comments), which shows that we are interested in someone`s business or a message where we can show our point of views and say something about the developer`s job. Facebook audience insights are very important for every developer, because this information gives us a clear picture of our progress. With it, we know what should be changed or optimized in our content strategy. To be sure that users will come and buy our products, we must be sure that they enjoy it. How can we check it? Just using Facebook data. Most of the profiles are open, so we can check our potential customer`s interests and make a strong inference in the end. We will give you an example of Facebook business and show a list of things that could change people`s interest in this current business. Imagine that you are an owner of a car washing service in New York. You are going to start a huge advertising campaign to draw people`s attention and increase the number of subscribers. If all your customers are from other cities or even from other countries, you can easily separate them from the total amount. With this point you will be able to decide how many people you need to engage to get a strong number of active subscribers. This point isn`t so important for our current example. However, you should understand that it could be used in other people`s targeting processes. For example, if you see that women pay less attention to your performance than men, you can concentrate on men`s part of audience. 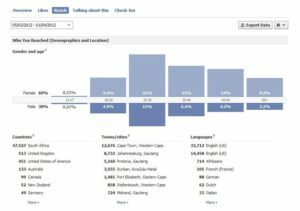 Facebook insights could help you there. Use Facebook analysis to analyze your page with this factor, and you will see the result. The most helpful point in targeting. Simple – if you know what people are interested in, you may decide whether you need them or nah. In our current example with car washing service, people who are not interested in vehicles at all are not important for us. The advantage of Facebook insights is that they could give us a full information about user. While talking about targeting, we should mention that we need only active users in our list of customers. If person opens Facebook profile once per months to read some articles about science or politics, it` not the person we need. Regular customers could visit the pages they are interested in at least twice per day (in the morning before the work and in the evening after work). On the other hand, we should understand that no one will stay online for the whole day because everyone has a family, a work and many other activities that are more important than social media. To had a good result from our targeting, we should realize how often people will be able to see our advertisements. The most optimal time for posting is from Monday to Friday from 7 to 8 a.m. in the morning and from 6 to 8 a.m. in the evening. If you navigate to page likes table, you will be able to see all top categories which your audience will most likely engage. At this point, the audience insight tool could show you which pages within of these categories have already been liked. With this information, you will be able to adapt your content to subscriber`s preferences. Such terms are staying very close to the advertising manager, but you should know the difference between these meanings. It may help you in the future. For Facebook, relevance is how actual your page is right now. It depends on the number of likes this current page has. Affinity is a notion that shows how likely your audience is to like a given page compared to everyone on Facebook. With audience insight tool, you are able to add a special “ideal custom profile”. And, after some Facebook tests, you ensure that you are doing everything right. ideal custom profile could be used in every sphere for every business. In fact, targeting isn`t an easy process that could be performed in one day. It needs deep preparation and audience analysis. Here we showed you some basic points that must be used while working with insights, Facebook analysis and other tools that helps you to collect information. We hope that you won`t forget about such points as “ideal custom profile”, social media data”, “relevance”, “affinity” and others. Good luck in your future projects!